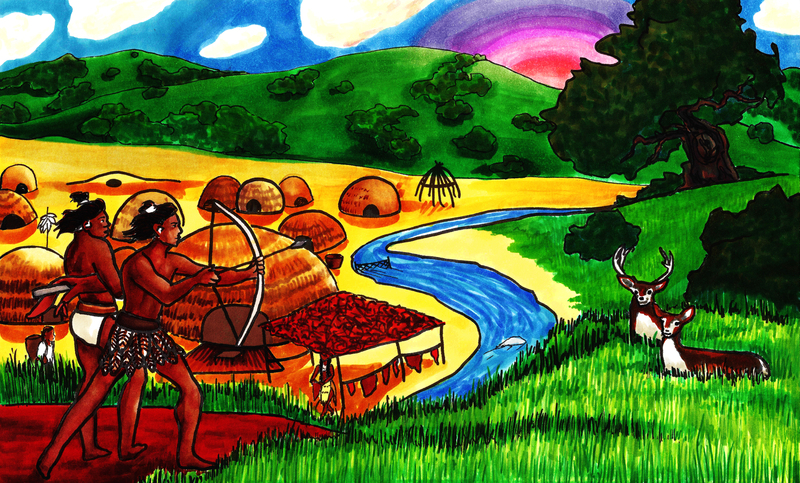 Evergreen was home to Ohlone Natives before Franciscan Missions would disassociate them from their lands. This vacuum created room for new residents without hesitation. 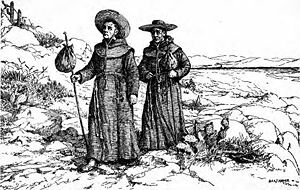 The first explorers of Northern California, or Alta California, were the Spanish. In 1542, less than a year after Columbus’s voyage, exploration of California would begin. Spanish would explore and conquer Mexico and an explorer and conquistador would pass the “Baja Point” into uncharted waters. Cortes sent Francisco de Ulloa to explored the coastline in 1539. In 1542, Juan Rodriguez Cabrillo would do some more extensive investigation and like Monterey for a naval base and well-suited to sustain itself. Spanish and English vessels would reach the Coast of California but only the Spanish would begin colonization from a Mexican base. It was believed that Baja California was an island. 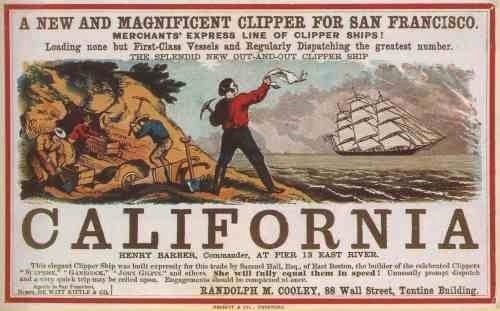 California was named after a mythical Amazonian island. In 1602, Spain would begin developing naval forts at Monterey and San Diego. 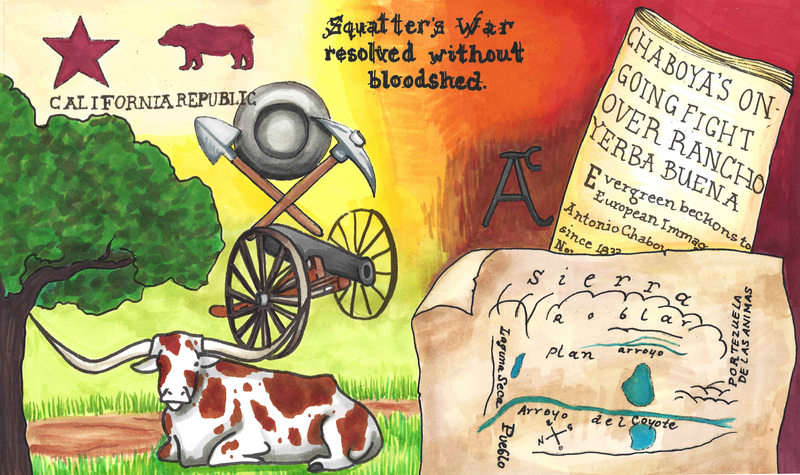 Serious colonization would begin as missionaries and soldiers explored California over land. This route would become the El Camino Real, Monterey Road and the Alameda through modern San Jose, marked with Mission Bells. Missions would begin to appear in Modern Day Mexico in 1519, however the threat of Russian settlements would hasten the efforts to colonize New Spain. The Spanish Empire would control the coastline for over 300 years. New Spain would be separated into two parts, Alta California, modern day California, and Baja, modern day Mexico. Gaspar de Portola, in 1768, would lead settlers of New Spain with a land and naval campaign, looking for Monterey but establishing Southern California Missions. Juan Bautista DeAnza would lead two expeditions into California. New Spain and the Spanish Empire expanded into New Mexico and Arizona, naturally. DeAnza left Tucson on this first journey and encountered agitated native populations. This made for a short trip to LA and home. Another expedition into Alta California in 1768 established the port at San Francisco and would introduce the Spanish intimately with the Santa Clara Valley as the route to San Francisco from Monterey over land. The chain of Missions would lengthen through the 19th century but not in order. It would not extend in the a numerical, chronological order. Santa Clara de Asis would be the 8th Mission opened and the Pueblo of San Jose would be founded in 1777. 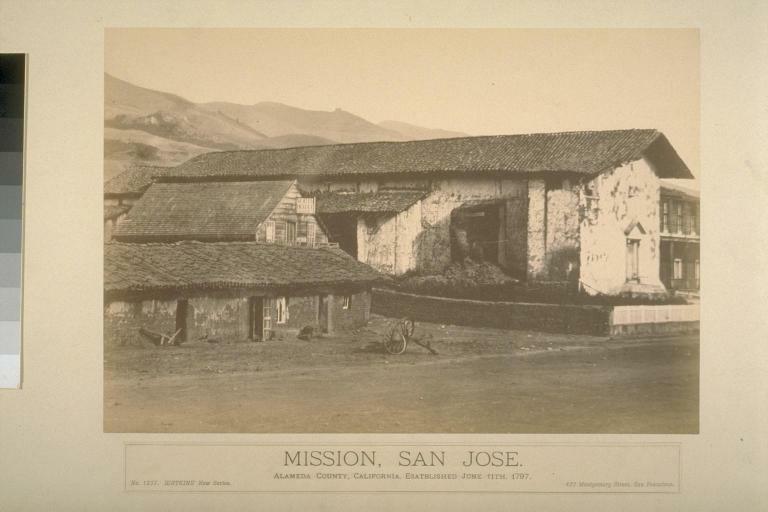 Mission de San Jose wouldn’t open until 1797 and the latest Mission would open in the Mexican Period. Mexican Independence would be won in 1819, and include all territories of New Spain. A couple of things brought on the revolt. Napoleon would conquer France and invade Spain. The Spanish Empire didn’t want to be ruled by another monarchy. New Spain had Old Rome’s, the Roman Catholic Church, approval to break away from the Spain crown. The War for Mexican Independence would end with the signing of the Treaty of Hidalgo in 1821. Mexico would set up its own monarchy, but opt for a republic constitution less than 2 years later. With 3,200 settlers at the time California, Alta and Baja, would need settlement to create growth. It’s this California that Antonio Chaboya would move to in 1821. 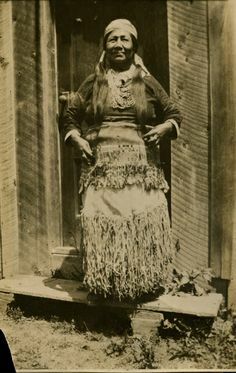 Native Americans coming to Missions would make up a lot of the economy in the Spanish Period of California’s History. Mexico would inherit these struggles. Mexico had a lot of problems in the upcoming years stabilizing the government and economy. Alta California wasn’t well settled and had no tax revenue coming in. Mexico was able to step up trade out of California by 25%, doing business with Russian on the West Coast for the most part. Monterey was the only port at the time and the capital of the Alta California Territoy. The Mexican Government applied at 100% tariff to pay for the Territory’s expenses. What does that look like? One for trade and one for the government. Tariffs like these made up approximately 90% of government income at the time, no matter where you lived. In 1827, the Mexican Government would dismiss their Spanish born residents. The Government would change formats too many time to really stabilize the area. So California, as we know it today, was expensive to operate without the strength in numbers to hold it steady. 87,000 indigenous people would be baptized by the Missions in 1800. Outbreak of disease in 1805-6 would decimate Native populations across California’s Missions. The Native American coverts would be treated like free labor, though they were promised land after a certain amount of service. Soldiers would retrieve people who fled the Missions. Those who hadn’t died due to new diseases were difficult to contain. 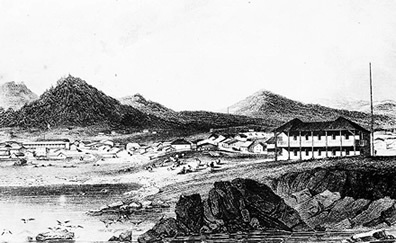 In 1826, the Governor of Alta California would release the indigenous people of their commitment to the Missions, working the land for food and shelter. The Mexican Government would find lessening Native populations also making the Missions a burden also now that they had to provide them land like other citizens and no one stayed to operate the Mission farmlands. The indigenous people would leave and assimilate to their new surroundings. The emancipation would make California a sympathizer and welcome member of the Union Army during the Civil War, 1861-1865. In 1833, the Missions would be secularized by the Government. In 1832, less than 18,000 survived. Mexico couldn’t afford to fund the churches. Acres of Mission lands would be sold off and granted to others. There were thirty preexisting ranchos granted by the Crown of Spain to friends and families of Government leaders, but none in Santa Clara County by Mexico’s Independence. Land Regulations would open up in 1824, allowing Mexican citizens to petition for land pretty easily and inviting Catholic immigrants to create new homesteads. In 1827, Spanish born citizens, including priests, would have to leave the Mexican Territory. This is when Mexican born Antonio Chaboya would’ve begun making his way to the Santa Clara Valley and eyeing the land. In order to obtain your land grant in California of the 1820’s-30’s, you would need to work your land for 5 years so you had a claim to it. The grants were often untracked with conflicting boundaries. 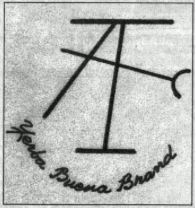 The disorganized manner in which grants were issued is the reason why this land grant to the right has a rectangular shape like the paper and no outlines. The land was cheap and there was practically no tax or dues on the property. Ranch owners would enjoy a barony type status, providing work and limited land to rand workers. Without the Missions farming the land, Ranch owners would step in, fill in that gap and reap the profits. Through the Mexican Period, forty-one grants would be made in Santa Clara County alone. In 1831, the Missions would record over 24,000 inhabitants of California- native, immigrant and Mexican. 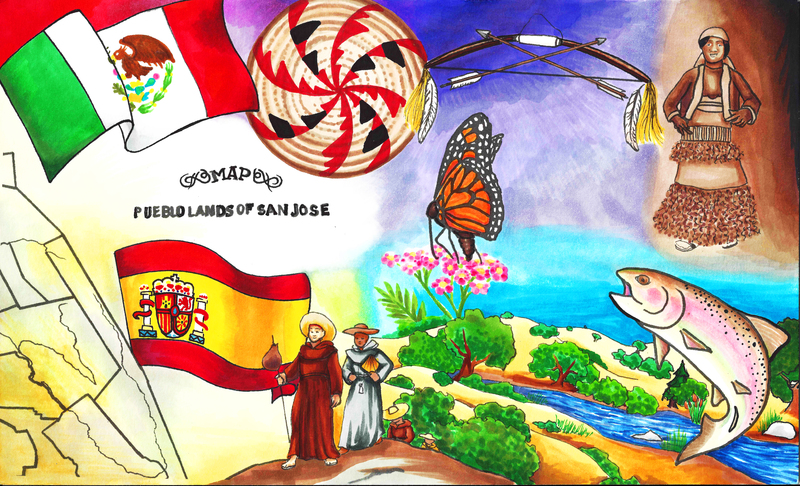 Rancho Yerba Buena would be granted to Chaboya in 1833. 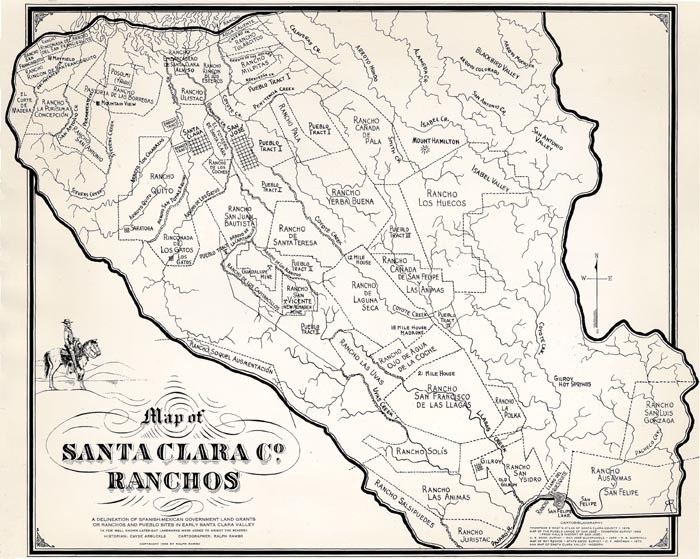 Santa Clara County’s first Ranchos would be granted in present day Gilroy, closer to Monterey. Chaboya’s would be the first recorded in present day San Jose. Neighboring Rancho Santa Teresa would be granted to the Bernal Family in 1834. 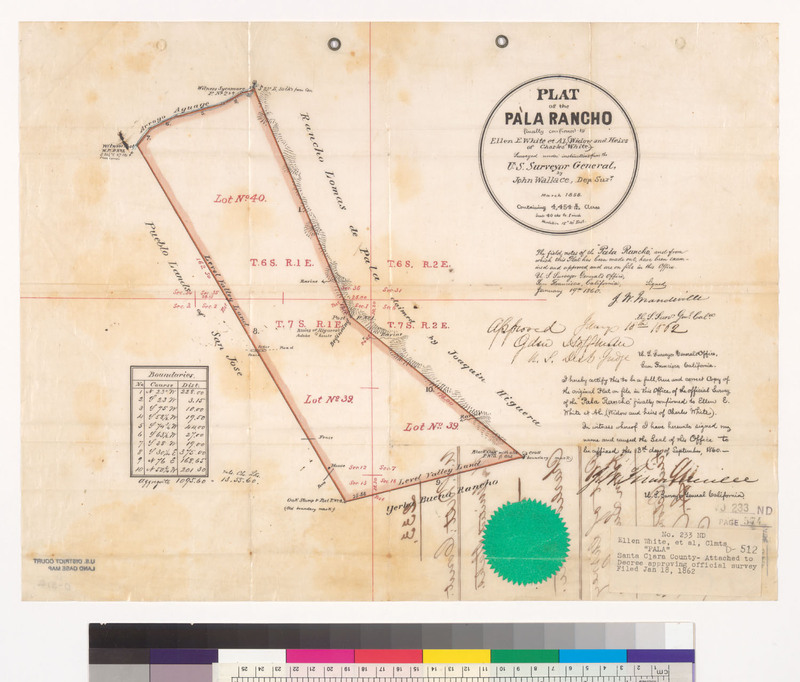 The Higuera Family would be granted Rancho Pala in 1835, selling it shortly afterwards to Englishman, Mr. Charles White. Rancho Milpitas would be sold to the Alviso Family. 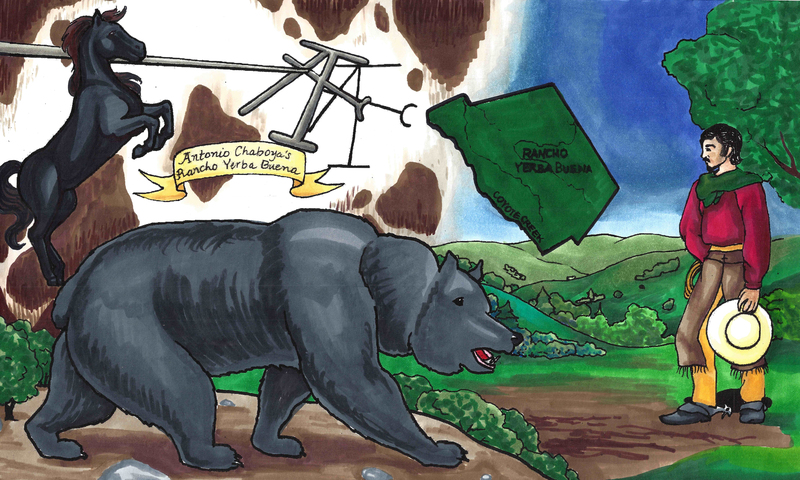 The Berryessa Family would be granted land in East San Jose in 1842. Are we recognizing any of these names? Antonio Chaboya would’ve heard about cinnabar in the hills, but probably didn’t mine even after hearing about nearby Almaden quicksilver mines. 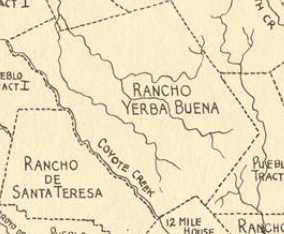 The Chaboyas enjoyed vast grazing lands on Rancho Yerba Buena. 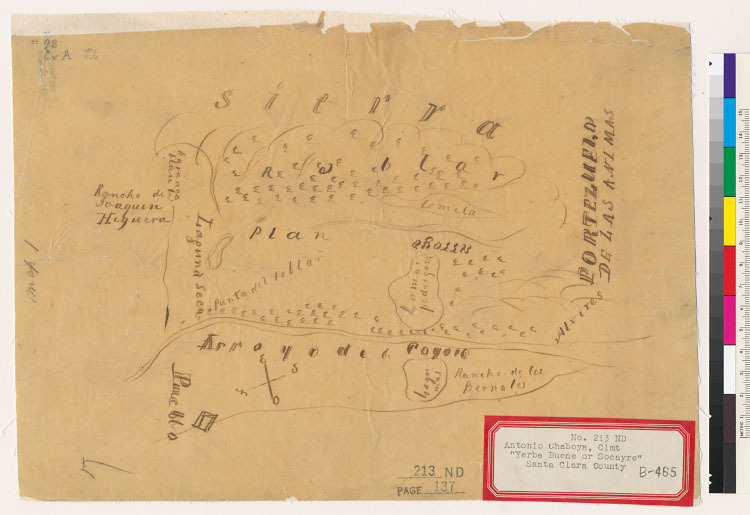 The largest of Santa Clara Ranchos, Rancho Yerba Buena was over 24,000 acres. 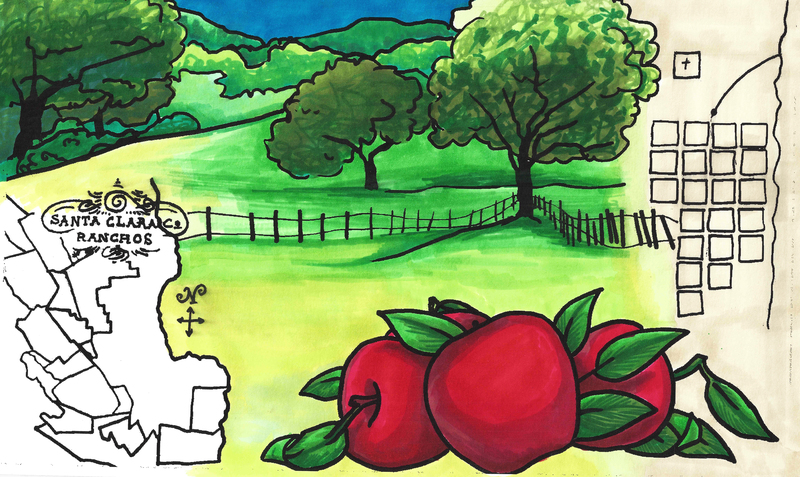 The Mexican Period was an awesome time to be Mexican landowner in Santa Clara Valley. The beginning of the end of the Mexican Period was a land grant made to a Catholic American immigrant, John Sutter, in 1839. Colonization is what Alta California needed and asked for. However, American immigrants to California would begin making their dissatisfaction with the Mexican Government known by 1840, staging various incidents. By 1844, Californios, native born Mexican citizens, would also revolt against disorganized Mexican Rule. By 1846, California as we know it has approximately 12,000 inhabitants. 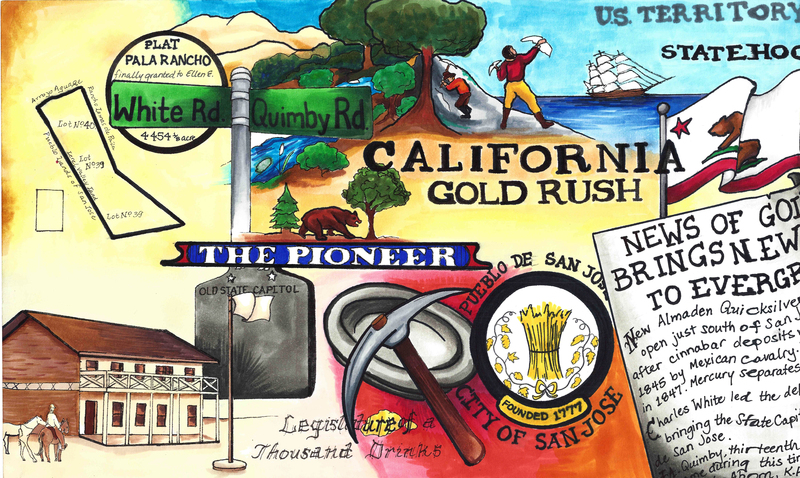 California’s Statehood would get underway a little before that discovery of gold, but the Gold Rush allowed California to become a State from a Territory very quickly. Before Gold, Texas broke away from Mexico in 1836 and didn’t want to be a part of the United States until 1846. War between Mexico and the United States would ensue over these territories with Americans, Catholics invited by the Roman Church, living in them. That same year, California would rise under the Bear Republic, neutralizing Mexican garrisons without violence or bloodshed. Less than a month later with the capture of Mexican Presidios, Alta California would succumb to US governance. John Sutter’s grant near present day Sacramento would discover gold in 1848. The end of the Mexican American War in 1848 would see the United States paying $15,000,000.00 for the territories of Alta California – present day California, Arizona, Nevada, Colorado, New Mexico and Texas. This would essentially wipe out the Mexican Government’s debts with the colonization costs. The Compromise of 1850 would see California to Statehood. 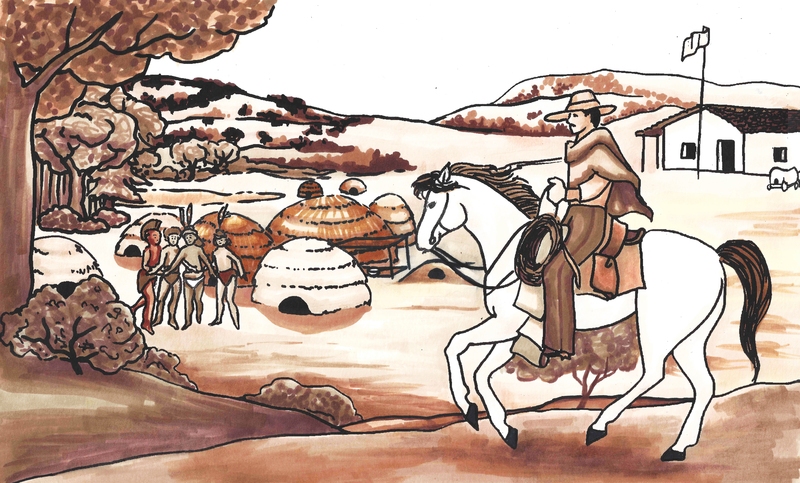 The Pueblo of San Jose, New Spain’s first non-secular settlement, would become the first State Capital with the help of some Evergreen players. Other Evergreen notables like the Pellier Family and Coe Family would move into Evergreen shortly thereafter. By 1850, there would be over 100,000 people living in California. That’s quite a boom. Here’s our artwork discussing this period of time.